Posted on Sun, Mar 7, 2010 : 9 a.m. Earlier this week, DeShawn Sims and two friends - Dior Gammage and Cortez Sanders - were driving around Detroit on a rare trip home from Ann Arbor when everybody in the car went silent. Chatter ceased. Memories of Marcus Pruitt, Sims’ younger brother who was murdered three months into Sims’ freshman year at Michigan, return randomly and with varying frequency these days. The timing of the latest Marcus Moment made sense. Sims played his final home game for the Wolverines days earlier, closing a chapter in his life that began with the biggest tragedy he's faced. Sims, now a senior forward at Michigan playing his final regular-season game today against Michigan State (4 p.m., TV: CBS), still goes through drastic ranges of emotions. Sometimes, it feels like yesterday he dealt with the anguish of burying his brother. Other times, it feels like a long time ago. “Every time his birthday comes up, I can’t believe it or another holiday comes up, you can’t really stomach it sometimes,” Sims said. “It’s real tough, especially, that’s the first person that I’ve lost that was really, really serious. That was the first person that I lost that was really serious and close to me. Sanders and Sims first knew each other from basketball, playing in the same neighborhood in Detroit and at a local community center. Gammage and Sims went to Farwell Middle School together. Sanders went to Cleveland but the three ended up at Pershing High School. If Gammage had $5, the group split it. If Sims came through one day with $20, they divided it amongst themselves, planned what they would eat and then bought it. If it required cooking, Sims would get behind the stove or oven, usually making his specialty - breakfast. There’d be hash browns, eggs, bacon and toast. Going into high school, they realized one thing. If they wanted to make it, to leave a part of Detroit that Sanders said has “too much killing going on, robbing, stealing,” they had to stay together, share with each other, help each other. 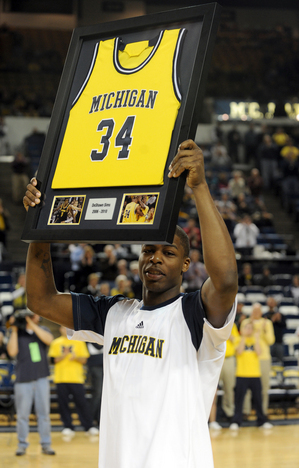 Manny Harris, Sims' teammate and closest friend on the Wolverines, later joined the group. As a senior at Redford High School, he attended Pruitt's funeral. To this day,Â Sims remembers Harris showing up at his brother’s funeral and how much it meant to him. The fact they have reached this point in their lives - close to college graduation and living in a location Gammage and Sanders say changed their lives and saved all three of them - is because of the bond they’ve shared. That bond was tested and strengthed when Pruitt was murdered in November 2006, soon after Sims and Gammage arrived as students at Michigan and Sanders started school at Eastern Michigan. Sims felt lost. He wasn’t sure he wanted to play basketball anymore or stay at Michigan. Coming into college, Sanders said, Sims felt he might play two years and then go to the NBA. As the best player in Michigan coming out of high school in 2006, it was a fairly realistic expectation. “It set me back because I stopped caring, like, whatever,” Sims said. “I’d start, whatever. I’d be on the bench and I wouldn’t even want to go in the game. Slowly, Sims started to feel again, to pay attention and want to play. He had a good game in his first start against Army on Dec. 28, 2006, scoring 13 points and grabbing eight rebounds in 29 minutes. He started again against Georgetown two days later and scored 10 points. Still mourning, he began to rediscover his game and his confidence. By the 2007 NIT, Sanders saw the Sims look like the player he remembered on the basketball court.Â By then, too, Sims had started to recover off the court with the help of his two closest friends. As Sims kept playing, he realized he did so not only for himself, but for teammates who stuck by him. He was playing for his family, both by blood and by bond. And he was playing for his brother, who was 6-foot-11 and had a college future of his own. “My brother is definitely at the top of my list,” Sims said. “He headlines the list of people I play for. He is definitely, sometimes I don’t realize it, how much of an impact he has on me still playing but it’s definitely a big impact. It has been more evident the past two months as Sims’ college career has wound down. There have been games this season he dominated for Michigan, averaging 18.4 points and 7.8 rebounds in Big Ten games in his final season. Through it all, he had his two best friends. The three realize they were lucky to escape their youth, come to Ann Arbor and see their lives change. Which goes back to the trip back to Detroit this week, to the car ride and the latest Marcus Moment. They saw what could have been, and how their bond and college changed everything. “It opened our minds up to that there are much better places out there than Detroit. But for all of our lives this is what we knew, what we got accustomed to and what we got comfortable with,” Gammage said. “So a lot of stuff that goes on here didn’t seem far fetched to us. Mon, Mar 8, 2010 : 4:19 p.m.
Hmmm, I guess we see how heartless MSU fans really are. Probably why Michigan rejected them in the first place. This piece had nothing to do with MSU, tournaments or any other game Michigan plays. It's about the opportunity three guys got that changed their lives and took their lives in a positive direction it probably wouldn't have gone in. It might not have mattered what college they attended, but you have to admit that Michigan is among the nation's elite in terms of academic and national prestige. It will take Sims, Harris and their friends farther than they could have ever imagined, regardless of basketball, and the great thing about them is they will make sure their friend from EMU succeeds, too. Unfortunately, this is an opportunity Sims' brother didn't get. Sun, Mar 7, 2010 : 5:06 p.m.
Uhhhh.... I'm not sure the Rodents can score 47 points in the second half.... What's the lowest tournament... CBI? Sun, Mar 7, 2010 : 12:25 p.m.
Sun, Mar 7, 2010 : 10:18 a.m. I bet Sims wishes he stuck with his first choice of MSU to play hoops. He would have made it to the finals last year instead of watching them on tv. He would have filled the missing piece of the puzzle for MSU. This year as well.